“It’s always good to be lost, because then you can find your way,” was what the charismatic Chike, owner of Bogobiri, said to me while I was buying some Highlife music from him one evening. That seems to be the essence of how we are constructing Playable City here in Lagos. Bringing together 11 participants from Nigeria and the UK—with a variety of experiences and disciplines—has to involve rewriting the way we do things, in order to bring collective interactions, rather than fixed and individual ideas. When Hilary (producer of Playable City, Watershed) and I came out to Lagos almost a year ago to do a recce of the city and to see whether people thought Playable City Lagos was a good idea or not, my heart instantly became close to the process. The question of how we can help citizens play isn’t just about developing games for games’ sake, but how we interact with the natural behaviour of people’s movements, making things easier, ‘freer’ and ‘funner’ in a city that although beautiful, can be very difficult at times. For example, what playful intervention can we experiment with on one of the pedestrian bridges (those connecting the Lagos mainland with its islands), that will make people use the bridge, rather than walking over the motorway, where there’s numerous road deaths each year? Creativity isn’t a luxury, it’s a necessity, something we are trying to pass on while we’re here. The way a creative person builds ideas is very different to a politician, and if we can dovetail these together, who knows what could happen in this and many other cities. From day one, the group of participants have gelled surprisingly quickly. They have adapted to their new surroundings and group mates with inspired excitement–personally I find them all truly inspiring. Every day, our Lagosian participants talk us through ‘My Lagos,’ a quick and snappy journey through their perspective of their city along with an overview of their work. Meanwhile the UK participants bring their experiences to the group in the form of games. It seems that the Lagosian participants took their UK counterparts under their wings from that first day and collaboration, exchange and support was organically inevitable from the beginning. There’s a special buzz in Lagos. It feels like it’s booming with energy and everyone is always ready to help me test my Lagosian handshake—a special cultural appropriation which ends with a snap of each other’s fingers. ‘Don’t rush the snap’ though! No Wahala means no problem here. There’s something playful in the sound of that itself. Having such a scarred history, it’s beautiful to see how the citizens of the Lagos are reappropriating spaces and I’m excited to see how we might help them do this more via Playable City Lagos. Over the past four days the participants have visited a number of sites around the city, with some journeys being easier than others. On our trip to the pedestrian bridge near Balogun Market, the participants had their first experience of the ‘area boys,’ who have a firm grip in money making tactics, reminding the participants that Lagos, although buzzing with opportunity, can also be hard to work with in a way that’s very different to our experiences in the UK. Public space is very rare here, trying to find a place where you don’t have to pay in to, or doesn’t involve some kind of restricted behaviour, is actually quite hard. For instance, the Tafawa Balewa Square site is massive and could be used by the community for a variety of things, but the gates remain closed most of the time. And Freedom Park, a beautiful reappropriated space for the public, (which used to be a prison), charges an admission fee. The participants have now formed their ‘teams’ and have begun to work through ideas that they would like to actualise. Initial ideas ranged from: pothole orchestras, kite flutes, interactive mirrors, interactive games in keke napeps and danfos, musical bumps at bus stops…and much more. I don’t want to reveal too much at this stage, because as the participants move with the programme, so their ideas will bend and change, and with this creative bunch, anything and everything is truly possible. We are constrained in the way that we discover this city, being on the bus to and from site visits and workshop spaces can be quite challenging logistically. However, the bus has become the canvas of informal play, appropriately named the Fun Bus, where ideas of all calibre are sparked amongst us. After a week of learning, sharing, experiencing, tasting, smelling – an all round haptic and ethereal experience–what better way to let your hair down than to go to The Shrine to see Femi Kuti (in my mind, the master of music) and his amazing dancers. My lovely colleagues provided me with a Nigerian name, Tiwa, meaning ‘ours’. With so many citizens here not feeling like they have ownership over their own city, it’s my hope that one day they will refer to the city as Tiwa. 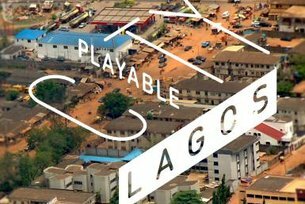 Playable City Lagos is created in partnership between British Council and Watershed, supporting by Future Lagos, Goethe-Institut Nigeria and CcHub. Huge shifts in the global economy, technology, migration and urbanisation are generating new opportunities as well as rising inequality. We need creative and collaborative ways to live and work together in our interdependent world.